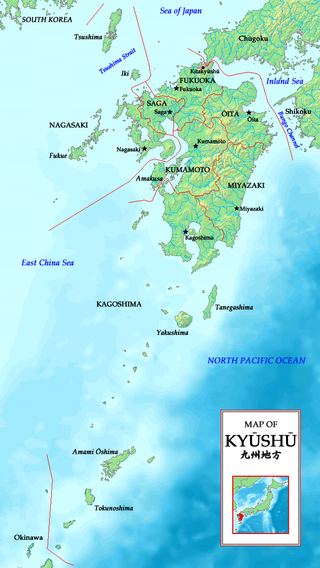 Kyushu (九州, Kyūshū, literally "Nine Provinces"; Japanese: [kʲɯːꜜɕɯː]) is the third largest island of Japan and most southwesterly of its four main islands. Its alternative ancient names include Kyūkoku (九国, "Nine Countries"), Chinzei (鎮西, "West of the Pacified Area"), and Tsukushi-no-shima (筑紫島, "Island of Tsukushi"). The historical regional name Saikaidō (西海道, lit. West Sea Circuit) referred to Kyushu and its surrounding islands. As of 2016[update], Kyushu has a population of 12,970,479 and covers 36,782 square kilometres (14,202 sq mi). 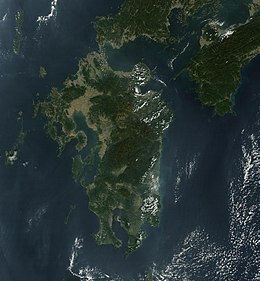 Look up Kyushu or Islands in Wiktionary, the free dictionary. Wikivoyage has a travel guide for Kyushu.